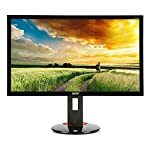 AOC have ramped up their gaming division in recent years and have made their mark on the game monitor market. The AGON range has definitely made a mark and the AG271QX has caught the attention of serious gamers looking for an alternative to the Predator and RoG gaming brands. 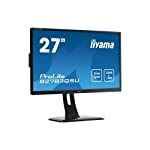 This model is a 27″ screen with a TN panel capable of a delivering a super fast 1ms response time. Refresh rates are equally quick with the much sort after 144Hz on offer here. You can also be assured of a crystal clear image thanks to the 2560 x 1440 QHD resolution. 1440p is fast becoming the standard for 27″ screens and works well at this size. I think it is definitely worth making this jump and the mid to top range cards of the current generation do a good job of running games at this resolution. You’ll need a top spec card if you’re expecting to get 144 frames per second though in a modern game! There is also a similar, but more expensive, IPS version of this monitor, the AG271QG. This model ramps up the refresh rate to 165Hz and also includes G-Sync, but expect to pay a premium for this. The AOC AGON is a slick sharp looking model what manages to look the business without resorting to the tactics employed by other gaming screens. That said, there is still the obligatory touch of red, it seems no manufacturer can withhold this from a dedicated gaming screen. Thankfully it’s mostly limited to the rear and the stand itself is a smart looking and unobtrusive silver base. But the build also has some other helpful features for the serious gamer, if you cart your PC around to LAN events then there is a helpful carry handle, and there’s a handy holder for when you need to hang up your headphones and take a rest. The monitor features a number of GameMode presets which can be accessed via a separate keypad, no need to fiddle with settings round the back. AOC’s Flicker-Free Technology and Low Blue Light mode are included, which they claim reduces eye strain, discomfort, and fatigue during those extra long gaming sessions. I’ve not tried it myself, but sounds good in principle. The AOC is a premium gaming monitor and as you might expect it is packed full of functionality to give you the best possible experience when tearing down the road in the large open environments of Forza Horizon 3! It is well setup for delivering a fantastic gaming experience, TN panels are known for their fast response times to keep ghosting and blur to a minimum. The 144Hz refresh rate will deliver super smooth animations assuming your GPU is up to the challenge of delivering 144 frames per second. It also supports Adaptive-Sync, this isn’t quite the same as FreeSync (which is based upon the VESA Adaptive-Sync standard) but still means you need an AMD card to take advantage of it. If you like a low latency environment, don’t we all, you can also enable AOC’s “Low Input Lag” mode which reportedly disables picture post-processing on the monitor’s electronics to enable faster pass through of commands. We give the AOC Agon AG271QX a 4.5 out of 5 rating. Want to know what existing owners of the monitor think? You can read real user reviews here. 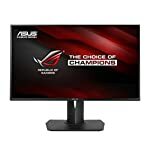 Should I buy the AOC Agon AG271QX? The AG271QX is part of AOC's premium AGON line of gaming monitors. It has numerous features which will give a great gaming experience at a crisp 1440p. If you are having some doubts about this purchase then why not read some real owner reviews and see what other buyers think. 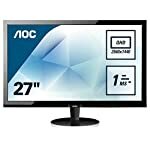 Welcome to the AOC Agon AG271QX FAQ. This section attempts to answer common questions you may have, please get in touch if you have any more queries or if you think our answers need updating. AOC are a Taiwanese company that specialise in screen technology. Their brand might not be as well known here in the UK as the likes of Dell and Samsung but these guys have been making monitors for decades! Can I mount this on the wall? Sorry, according to the official specs there is no wall mount included on this model. 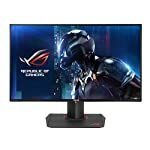 Is this a FreeSync monitor? As far as the specifications I’ve seen say: it is an Adaptive-Sync monitor. This means it conforms to the VESA standard but FreeSync has some additional requirements to verify before a manufacturer is allowed to use the AMD FreeSync stamp on their product. You’ll still need an AMD graphics card to make use of this technology. You can read more about the sync standards here.